Ok, that would definately hurt! OK, that explains the FIRST pain, but not the next, & the next, & the next… WHY would he LEAVE THEM THAT WAY???!? What, you that if you get an inexplicable pain somewhere in your body, you don’t repeat what you just did in an attempt to identify the cause of the pain? It’s a very basic medical technique. Kiche: It’s like that with us computer programmers. Someting goes wrong, wipes out the universe. We fix the universe and see if we can make the problem happen again. Simple. 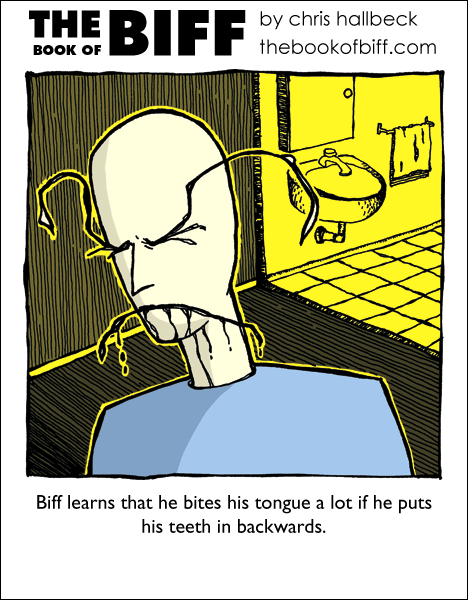 Biff: ow! I… ow! bit… ow! myself… Ow! Bad Biff! No imitating Silent Hill! You know, there are a few people I know of (they’re in college, I should be, but I don’t want to) that need dentures. Of course, that has got to be the most painful thing to wake up to! Hmm. Looks a bit like me after I got six teeth pulled and was high on nitrous oxide. He bleeds black, the emo! @Deteramot: Actually, I think he’s bleeding ink. @Deteramot: CRAAAWLING IIIIN MY SKIIIIN….